Grey seals are found on both sides of the North Atlantic, also on the West Coast off Canada, on the East Side of Iceland, the Faeroes, Northern Norway, North East Russia, in the Baltic Sea and off the British Isles.The British population - two thirds of the worlds population - is found principally off the Scottish Islands, Cornwall and the Scillies, the Pembrokeshire Islands, the Farne islands and the North and West coasts of Ireland. Favoured haul out sites include inaccessible islands, coves and caves. 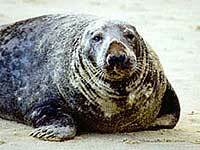 These are smaller than grey seals and their coats are more extensively spotted. Their facial features are also different, with snub noses and nostrils that form a ″V″ shape. 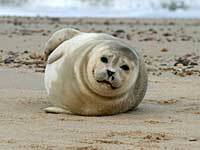 Common seals prefer hauling out on sand banks and gently shelving rocky, shingle or sandy beaches. They are found on both sides of the North Atlantic and on the Eastern seaboard of the North Pacific. The British population is distributed mainly in the Wash, the major Scottish estuaries, the Scottish islands and West Coast, and the West Coast of Ireland. Occasionally they are found off the Cornish coast. Staff at the Scottish SEA LIFE Sanctuary have condemned the Canadian Government for allowing nearly a million seals to be killed over the next three years in the largest hunt of marine mammals...including 350,000 seal pups. Click here to read more.